Amavasya is actually the dark moon phase. The dark moon phase happens when the moon is within a distance of twelve degree of angular distance, between the moon and sun before conjunction. The various phases of the moon have special significance in all the observances as per Hindu beliefs. Etymologically, the term Amavasya is derived from Sanskrit Ama and Vasya. Ama means together and Vasya means to cohabit or to dwell. According to ancient Indian culture and belief, Amavasya is a time of great power. Amavasyas are the fifteenth day of the month and are the new moon phase or the no moon phase of the month. Of the lunar calendar, Amavasya is the first day of the first quarter. It marks the end of the dark moon phase or the Krishna Paksha. Lot of people chooses to do Tarpan, or an offering towards their departed ancestors on this day. People keep fast on this day, and the Kalasarpa dosha Puja also takes place during the Amavasya. The Presiding deities of the Amavasya tithis are the PIthri Devathas. Solar eclipses always happen during the Amavasyas and are the most propitious time to perform snana, tarpana, shraddha etc. Darsha amavasya or Darsh amavasya is the no moon night in the traditional Hindu calendar. On this night, moon is completely absent. It holds a great importance in Hindu religion. This day is the first day after no moon day. People observe fast on this day break it after sighting new moon on Chandra Darshan day. - Day of fasting which is dedicated to Chandra dev, the god of the moon. - The god of moon i.e., Chandradev is the most important Navgrahas of Hinduism. He is the lord of emotions and divine grace. He is considered as the nurture of plant and animal life. - People who worship Chandra dev on this day can gain good fortune and prosperity in their lives. - It helps in accessing progress in lives. - It reduces the delays and reversals in life. 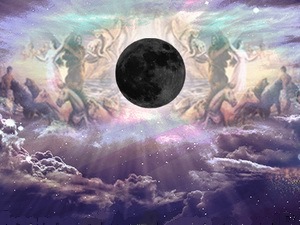 - Worshiping Moon on this day, one can gain spiritual sensitivity. - This provides coolness and serenity to the mind. - The day is associated with wisdom, purity and good intentions. - One prays to the God to seek success and good fortune in life. This day is an optimal day to pray for salvation. Worshiping forefathers (known as Pitra in Sanskrit) on this day is considered as the most important part of the day. Many worship to achieve Moksha (completing the circle of life and death) and also attain their wishes and blessings for a good fortune.